The Garmin Forerunner 620 was Garmin's flagship running watch, but without inbuilt heart rate (HR) tracking, unlike the newer Forerunner 225. However, the 620 remains a formidable package, especially once paired with an HR strap. At the moment, you can get it for about £200 on its own or £230 if you shop around ($350/$400 or about AU$430/AU$500). The imminent arrival of its replacement, the Forerunner 630, means it should get cheaper, too. Garmin broke the old running watch mould with the 620 screen, rolling out a colour touchscreen to confound the competition. In practice, the colour element isn't that noticeable, like an early Donkey Kong 'colour' screen, and the touchscreen isn't super responsive, but I applaud the effort. What's important is that the 1.0-inch (25.4 mm) diameter screen is easy to read, with an 180x180 pixel resolution and a competent backlight to aid viewing in low light. The battery provides a claimed six weeks in watch mode (ie: without GPS for tracking and ANT+ for attaching a pulse monitor) and up to ten hours in training mode (ie: with GPS and ANT+). Impressively, my testing suggests that'd be about right. This is not a device that needs charging a lot, which is a real boon. The charging cradle is - as usual with Garmin - a unique device that hooks into 4 contacts on the rear of the Forerunner 620, pulled into place with a fairly powerful magnet. It's an easy system to use, the magnets pulling the watch into position in a positive motion. No danger of mis-charging here. The overall build and design is that of a traditional round watch with a sporty edge. It's fairly big – 1.8x1.8x 0.5 inches (45x45x12.5mm) – and not exactly handsome, but by running watch standards, it's actually fairly understated. I could well imagine wearing it as a normal watch around town. The strap is a ventilated number with an absolutely standard watch buckle, which works perfectly well and keeps things simple. Given the 620's featherweight 1.5 oz (43.6g) weight the strap isn't working too hard, but Garmin has made the strap mounts relatively beefy, which is a comforting touch. Garmin claims a 5 ATM water resistance, which should prove sufficient for 'surface swimming', and is defintely enough for any running-related wet moments. My test unit has shrugged off showers, both indoors and out. It's relatively easy to get underway with the Garmin 620, in part because it is specifically targeted at runners, so there's no extraneous settings or sports to get bogged down in. Hit the run button, wait for HR and satellites, tap the screen to get a green arrow, then hit the road. Garmin's GPS chip is pretty strong, giving accurate tracking and a super-fast lock time. Sadly the 620 relies on the older ANT+ standard to connect to heart rate devices, which we've never found as reliable as Bluetooth Smart. The setup always feels a little flaky, and took multiple attempts to successfully connect in this case. Once in motion, you've got the usual metrics (pace, time, distance, HR rate) displayed clearly on a series of screens that you 'swipe' the touchscreen, or tap to navigate. In honesty, I am not convinced by the 'swipe'. Sometimes it's super-responsive, sometimes it's completely the opposite, and that's the case with or without an excess of rain or sweat, and irrespective of which fingers you use. On the brighter side, the HR rate screen has an excellent zone split display, giving you an at-a-glance HR zone (for example, 3.9) readout, making cardio zone training entirely idiot proof. It's a simple trick, but a neat one. In addition, you've got a range of Garmin smarts at your disposal, such as Virtual Pacer (where you pick a distance and get a screen showing your current pace to that target), Race Predictor, (which gives you projected times for 5k, 10k, half and full marathons) and a recovery timer. This last not only gives you a suggested recovery time after your session, but also chips in at the end of each run, telling you how well you are recovering from exertion in an immediate sense. Obviously that's a key metric for overall fitness. The Garmin also tracks your cadence, and provides a handy assessment at the end of each session - you're aiming for somewhere in the region of 180 strikes per minute ideally. A more detailed insight is available when paired with Garmin's HRM Run, strap-on pulse tracker, which opens up a new world of data in the shape of 'Running Dynamics'. This is real next-level stuff, using the accelerometer in the HR monitor to glean a new layer of data, including such gems as ground contact time tracking and vertical oscillation (the total vertical movement of your torso). The former measurement can be contrasted with elite runners, who typically spend under 200 milliseconds in contact with the ground each step, according to Garmin. Post-run stats on-watch are excellent, providing a full breakdown of distance, laps, HR average, split times, etc as well as cadence. If it's not here, you probably don't need to know about it. We tested the self-explanatorily-named Garmin Soft Strap Premium Heart Rate Monitor (£50, $70, AU$100). It's not a new design, and has a few quirks, among them being the difficulty in changing the battery, and the weird tech black hole you enter when it won't pair. Our first effort at pairing with an older strap just wouldn't work at al, and having fiddled with the tiny screws to insert a fresh battery (which should last 4.5 years according to Garmin) to no avail left us in the lurch. The Garmin Soft Strap Premium is ANT+ based rather than Bluetooth Smart so won't sync with a smartphone like the Polar H2 does, but once up and running delivers pretty solid results. On the flipside, Bluetooth devices such as the Polar tend to get terrible interference if there's a lot of them around, such as at the starting line, or in a gym. Although the Garmin Soft Strap Premium Heart Rate Monitor is waterproof to 30m it won't transmit underwater, but weighing in at 45g, it's light enough to wear for long periods. It's fine for running, accurate enough, if a little last-gen. 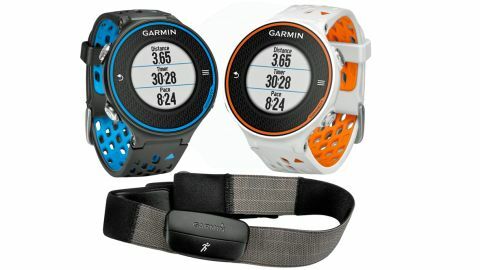 If you want the Running Dynamics tracking mentioned above, there's also the option of the Garmin HRM Run. This is double the price, its accelerometer does let you measure a range of key, technique-related stats. This is well worth considering if you want to get really serious about your running, but is probably inessential for most users. My test device had issues pairing with an Android phone, but sprang into action on iOS, was flawless over Wi-Fi and swift enough when docked with a PC. Garmin really delivers on the analysis front, harvesting the widest range of running data possible and syncing it effectively. The app itself is a little basic in contrast to the watch display and the browser version, so we'd venture that 620 devotees will spend much of their time viewing at one extreme or the other. In a browser it's the same old Garmin Connect we know and love, packed with data, social sharing options, maps, graphs, challenges and personal best tracking and sharing. It's one of the most complete packages out there, and rarely disappoints. You just select the tiles you use most for your dashboard, bin the ones you don't, it's all very configurable. The coaching options available cover a broad spread of effort that'll provide value for pretty much anyone, and the UI is easy to navigate with practice, if admittedly slightly bewildering at first sight. Although an amped-up version of Connect is good enough for Garmin's pro cycle teams, you may want to export your data elsewhere, which is also possible, via standard .FIT files. There's VO2 Max estimation in-watch and online, which provides a solid guesstimate of your body's maximal oxygen consumption in a handy colour gauge (in-watch) and a similar tool onsite. A graph lets you plot your progress in this key fitness test, over time. One final, neat trick Garmin has packed into the 620 is actually quite a simple one: the bottom right-hand button is dedicated to triggering 'Wi-Fi sync'. This means that once the device is setup on Garmin's Connect data-tracking service, with your Connect account details and your home Wi-Fi password, the Forerunner 620 will fire your latest session up into the cloud with a press of the button. It's a small thing, but being able to do that from the shower or wherever you happen to be when you remember is surprisingly handy, and something we'd love other manufacturers to do as well. Obviously syncing the watch with the Garmin Connect app via Bluetooth or the desktop app via the charging sled achieves the same thing, but that's a longer process. The Garmin 620 has a lot of next-level tricks up its sleeve, on top of the usual session tracking. Cheeringly, none of them are anything to do with activity tracking, sleep tracking or alerts. The 620 does none of these things, but instead offers trickery like Running Dynamics, race predictor and Wi-Fi sync. As mentioned elsewhere, this is a single-minded device for runners. If you're looking for smartwatch-style alerts, a step tracker or are considering cycling, crossfit or other sports, you're out of luck here. The Garmin Forerunner 620 is a cracking running watch that tracks lots of important parts of your running and recovery, plus some interesting, if more esoteric, metrics. Paired with the HRM Run it's an absolute powerhouse. It's not a criticism as such but many runners really won't need this level of sophistication, or the hassle of an external heart rate monitor, and would therefore be better off with something like the Garmin Forerunner 225 or TomTom Cardio Run. The Garmin 620 is a powerful, watch for proper runners. There are stats galore here, some neat design touches, and strong tech credentials. It's not quite as easy to use as the Polar V800 in my opinion, but it delivers much of the same pro-grade data at a similar price point, then goes the extra mile when you add in the HRM Run strap. Whether you're a keen beginner, a seasoned amateur or verging on pro (or at least like to think you are), the Garmin has something to offer to improve your running. So if you're interested in a single-minded, serious running weapon, this has to be very near the top of your list. The only possible fly in the ointment is the arrival, very shortly of the Forerunner 630, but that appears to be aimed even higher up the seriousness chart, and is unlikely to make the 620 appear worthless (to most non-elite runners, anyway) overnight.